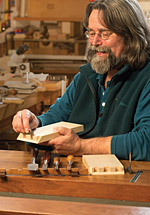 David Charlesworth began his furniture making career in 1973. 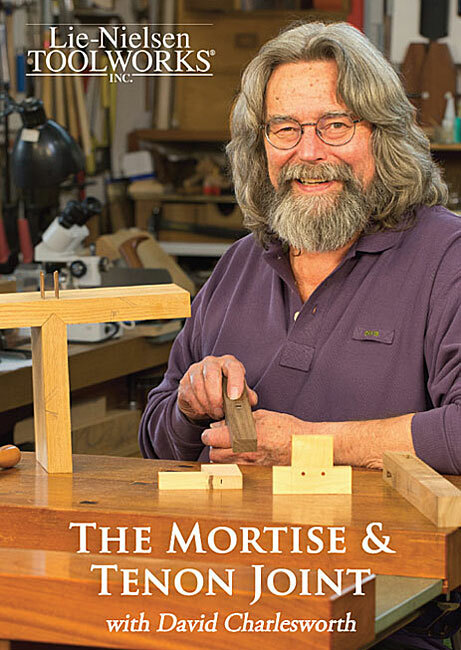 For over twenty-five years, he has taught woodworking at his Devon workshop, and is widely respected in England as a writer for Furniture & Cabinetmaking magazine. 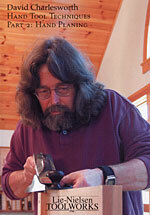 His specialty is getting the most out of hand tools in precise, original and efficient ways. 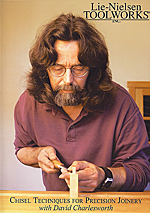 This first DVD explores David’s techniques for sharpening plane blades. Learn how to get a razor sharp edge in minutes, and how to camber an edge with confidence. Lie-Nielsen Toolworks, Inc., 2004. DVD. 77 minutes. 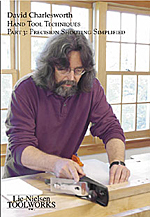 This DVD explores David’s hand planning techniques for precise, efficient preparation of furniture-sized components. Shooting boards can help a woodworker achieve accurate work quickly and reliably. 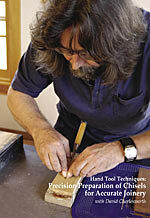 This third DVD in David’s series ‘Hand Tool Techniques’ explores his approach to the use of shooting boards. 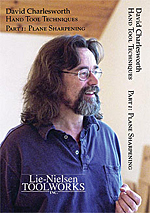 Lie-Nielsen Toolworks, Inc., 2005. DVD. 63 minutes. Chisels are an essential part of every woodworker’s kit. Preparing chisels for precise work differs in some important ways from preparing plane blades. In this DVD, a companion to David’s DVD on the treatment of plane blades, he explores these differences. His techniques employ waterstones and a simple triple bevel to speed the honing process and get a razor-sharp edge in minutes. Lie-Nielsen Toolworks, Inc., 2006. DVD. 64 minutes. David unlocks the secrets of chisels, simple but sophisticated tools. Properly tuned and used, chisels are capable of very precise freehand work. Join David’s exploration of this versatile tool. This DVD also features a printable PDF of Robert Wearing’s transfer jig. Lie-Nielsen Toolworks, Inc., 2007. DVD. 100 minutes. 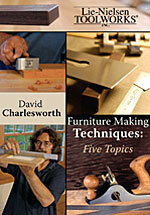 This DVD explores the five important skills that will help you refine your woodworking. Woodworkers often debate the best way to get a smooth surface directly from the hand plane on difficult to plane woods. David’s techniques are easy and effective. Tips on edge-jointing, finish planing an assembled frame and panel, crisp decorative bevels to finish edges and the effective use of the shoulder plane are all well thought out and refined by years of experience. Lie-Nielsen Toolworks, Inc., 2008. DVD. 188 minutes. The secret mitred dovetail has a reputation for being among the most difficult joints to cut successfully. In this DVD David will show you that this fascinating joint, with its many uses, is not as hard as you may think. Lie-Nielsen Toolworks, Inc., 2014. DVD. 168 minutes. 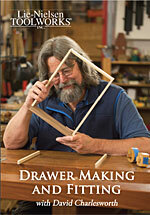 In this DVD David shows the making and fitting of a first class, English Arts & Crafts drawer. This exhibition quality drawer has an effortless, silky action for two thirds of its opening. It then tightens slightly on the carcase, preventing it from being inadvertently pulled out. The flush drawer slip, with scratch bead, gives an elegant result suitable for the storage of photographs and documents. The Knuckle and Rule joints are two articulated joints that serve as hinges for the drop leaves found on sofa tables and Pembroke tables. 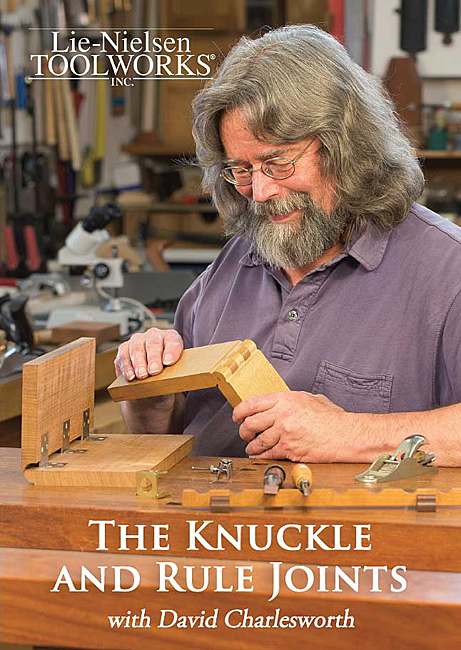 The Knuckle joint is a shop made hinge with wooden barrels turning on a metal pin. These allow the supports to extend and fold away in an elegant manner. Rule joints employ special hinges made with one leaf longer than the other, with the countersunk holes on the face opposite the barrel. David offers his original methods for tackling the intricacies and careful fitting of these fascinating joints. David Charlesworth has taught woodworking since 1973 and is widely respected in England as a writer for Furniture & Cabinetmaking Magazine. His specialty is getting the most out of hand tools in precise and original ways. 113 minutes, DVD. Lie-Nielsen Toolworks Productions, 2017. 176 minutes, Lie-Nielsen Toolworks Productions, 2018.